Here's the official press release with all the details about 2.5. I'll un-pack each feature over the next several minutes. New software updates bring popular television shows to online store, enhancements to online music community and subscription service. REDMOND, Wash. — May 5, 2008 — Microsoft Corp. today announced that Zune, the company’s all-in-one digital entertainment brand, is adding new software features and content to the Zune online store, music community and Zune Pass monthly subscription service. Zune is expanding its video store to include downloads of popular television shows from COMEDY CENTRAL, FUNimation® Entertainment, MTV, NBC Universal, Nickelodeon, Starz Media (including Magna Entertainment), Turner Broadcasting, Ultimate Fighting Championship® (UFC) and VH1 that consumers can sync to their device and enjoy on the go. In addition, by further integrating the Zune music community into the core experience, the new software makes it easier for people to find and listen to the music they want, share it with friends, and take it with them wherever they go — whether they choose a Zune Pass or a la carte MP3 downloads. Zune Pass subscribers can now set up automatic, real-time feeds of the music their friends are listening to and add those songs to their collection or Zune device. Starting today, consumers can choose from more than 800 episodes of popular television series to download and watch on their computer or their Zune, including COMEDY CENTRAL’s “South Park,” FUNimation’s “Afro Samurai” and “Witchblade,” MTV’s “The Hills,” NBC’s “The Office,” “Heroes” and “30 Rock,” Nickelodeon’s “SpongeBob SquarePants,” SCI FI Channel’s “Battlestar Galactica” and “Eureka,” Starz’s “Ghost in the Shell” and “Street Fighter,” Turner Broadcasting’s “Metalocalypse” and “Robot Chicken,” UFC’s “The Ultimate Fighter®” and “Fight Night™,” and VH1’s “Rock of Love” with Bret Michaels. Each television show will be priced at 160 Microsoft Points per episode (approximately $1.99) at launch. With more than 3.5 million tracks, two-thirds of which are available in pure MP3 format, 800 television shows, 4,800 music videos and 3,500 audio and video podcasts, the Zune online store is a great place for consumers to find the entertainment content they want. In addition, the bright, full-color screen on every Zune portable media player delivers a high-quality video experience on the go. In a recent study commissioned by Zune, 54 percent of consumers surveyed said they were frustrated when trying to find new music, mostly because they said they didn’t have enough time, didn’t know where to look, or felt that they ended up wasting money on music they didn’t end up liking. At the same time, 89 percent said they would trust a friend or family member’s musical recommendation over a music critic’s. The growing Zune online music community enables consumers to explore, discover and share music. Members get a free, customizable Zune Card: a snapshot of their favorite tracks and the music they’re playing on their Zune. Previously this personal snapshot resided only on the Web, but with the latest software updates Zune Cards have become much more portable. Now consumers with the Zune Pass subscription have the ability to take what their friends are listening to from the Zune music community on the go via Zune Card personal playlists for easy exploration and access, when and where they want it. The Zune Pass subscription allows consumers to explore millions of tracks with no commitment other than the monthly fee similar to the price of one CD — $14.99 per month. •	Syncing Zune Cards to a device. Consumers simply drag and drop Zune Cards from friends to a Zune device and get updates on what friends are listening to every time they sync. If the song is available with Zune Pass, subscribers automatically have the full tracks on their Zune while nonsubscribers have full album information and artwork. If consumers hear something they like, they can add it to their collection with one click. Next time the user syncs his or her Zune, he or she will be asked to confirm the purchase. •	Enhanced friends search. Consumers now have the ability to add their name, location and bio to their Zune music community profile, making it easier than ever to find their friends. •	Instant friends. The true power of the Zune online music community is unlocked when friends are added and consumers can follow the music they’re listening to. Now, when new Zune owners join the Zune online music community, they’ll find the top music editors from the Zune Marketplace team already added to their friends list, giving them a head start in finding new music. •	Artist and album reviews. Inside the Zune music community, members have the ability to write and post their own reviews for artists and albums, providing another community-driven feature to support the exploration and discovery of music. The music community helps to find and recommend the best music. •	Reputation badges. Now members of the Zune community can earn badges that are displayed on their Zune Card showing they’re passionate fans or active members. •	Windows Live connections. Windows Live Messenger contacts will now be able to see what users are listening to via the Zune software. Clicking on the tracks displayed in the “Now Playing” feature will connect the Windows Live Messenger friend directly to that artist’s page on the Zune Social. •	Auto playlists. Users can create an auto playlist that updates itself automatically as new music is added. •	Browsing videos. Consumers can browse their video collection by genre and series, plus they can preview videos before they play them on full screen. •	Editing album and track information. Users are able to edit track or album information (metadata) quickly via multi-select and drag-and-drop. The advanced metadata editing features make it easy to edit multiple tracks or survey albums and artist information. •	Organizing collections. In addition to sorting by artist or album, consumers can now sort by genre. While browsing by genre they can further sort music by artist, album or release year. •	Gapless playback. Consumers will now be able to listen to an album without the brief gap between tracks, both on their Zune and in the Zune software. This is a must-have for live-concert recordings and compilation albums. •	Syncing groups. 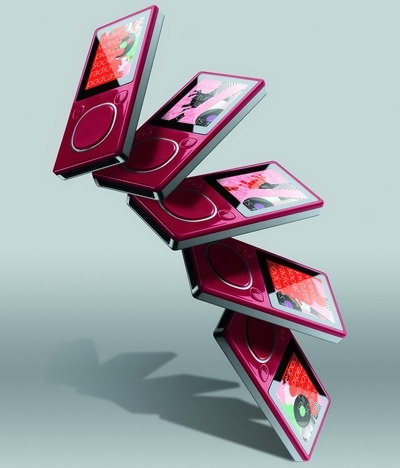 Zune software now syncs to multiple Zune players simultaneously. Users can prepare which content on their computer to sync even when their Zune isn’t connected. Consumers can create custom sync groups for music, pictures and videos. •	Zune reminders. Experience is improved when a Zune player’s memory is nearing capacity, via an easy-to-use tool. More information on Zune and related images are available at http://www.zune.net/press. Zune is Microsoft’s music and entertainment brand that provides an integrated digital entertainment experience. The Zune platform includes a line of portable digital media players, the Zune Marketplace online store, and the Zune Social online music community, created to help people discover music. Zune is part of Microsoft’s Entertainment and Devices Division and supports the company’s software-based services vision to help drive innovation in the digital entertainment space. More information can be found online at http://www.zune.net/en-us/press. Founded in 1975, Microsoft (Nasdaq “MSFT” is the worldwide leader in software, services and solutions that help people and businesses realize their full potential."